Wine connoisseur Annie “Halsey” Hall must turn up the heat on a felonious firebug . . .
Halsey and the ladies of the Rose Avenue Wine Club are celebrating with newlyweds Penelope and Malcolm, who are thrilled to be opening their new winery. They’re also partnering with a cherished neighborhood eatery, Rico’s Pizza, which will be serving young clarets from their fall harvest. But as Halsey attempts to savor the bouquet of her Tooth & Nail Cab, a different scent intrudes—smoke. The nearby pizza parlor is going up in flames. As they rush to the scene, Halsey’s rescue dog Bardot pulls a body from the burning building—the pizza delivery driver—but it’s too late. 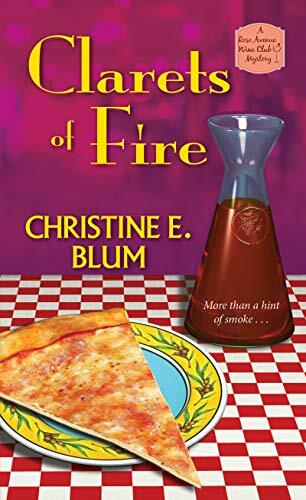 When investigators determine a rag soaked with gasoline in a bottle from the winery started the blaze, police suspect both the pizza parlor owners and Penelope and Malcolm of arson and murder. With her friends’ business and freedom at stake, it’s up to Halsey to smoke out the real arsonist—before somebody else gets scorched . . .